The 1963 Fender AB763 blackface Vibroverb is my favorite amp of all time. 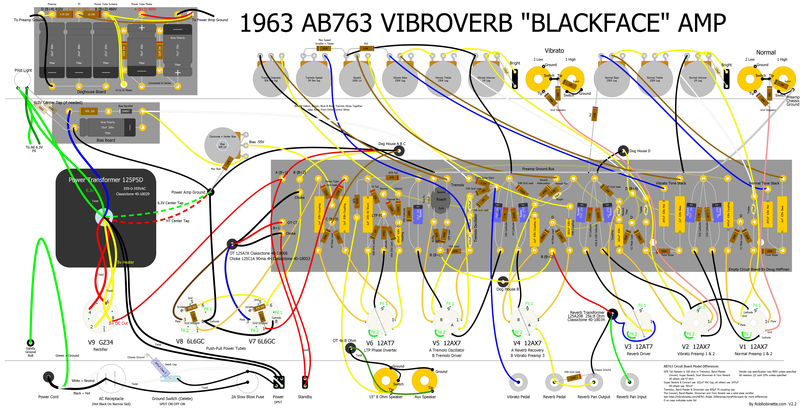 It will be forever linked to Stevie Ray Vaughan's amazing tone but building a blackface Vibroverb is a daunting task, even for an experienced amp builder. 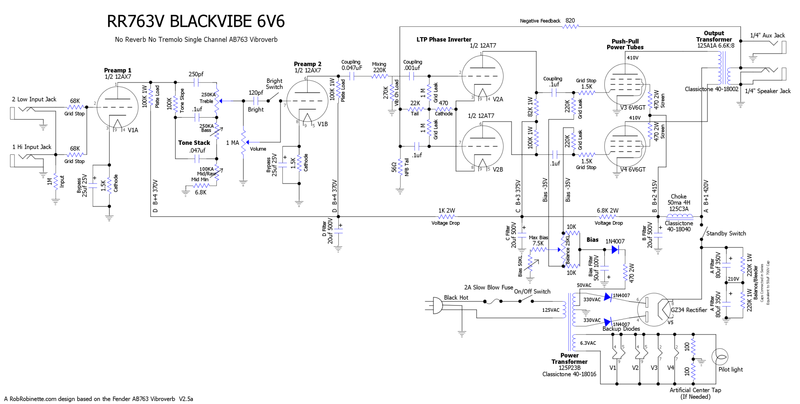 I designed the RR763 Blackvibe amp for builders who don't want to deal with the complexity of the AB763 circuit's reverb, tremolo and dual channels but still want its authentic Normal channel tone. Throw a Strymon Flint reverb & tremolo pedal in front of the Blackvibe and you have a Vibroverb Vibrato channel too. Removing the reverb, tremolo and Vibrato Channel drops the preamp tube count to only two but the tone stays 100% Normal Channel Vibroverb. The rest of the amp stays true to the Vibroverb. This amp uses authentic Vibroverb power and output transformers and choke so voltage levels and power output are all blackface Vibroverb. It's very much a single channel Vibroverb. Download the pdf here and the DIYLC file here. The speaker is a 15" JBL D140. Build by Iain Moncrieff. 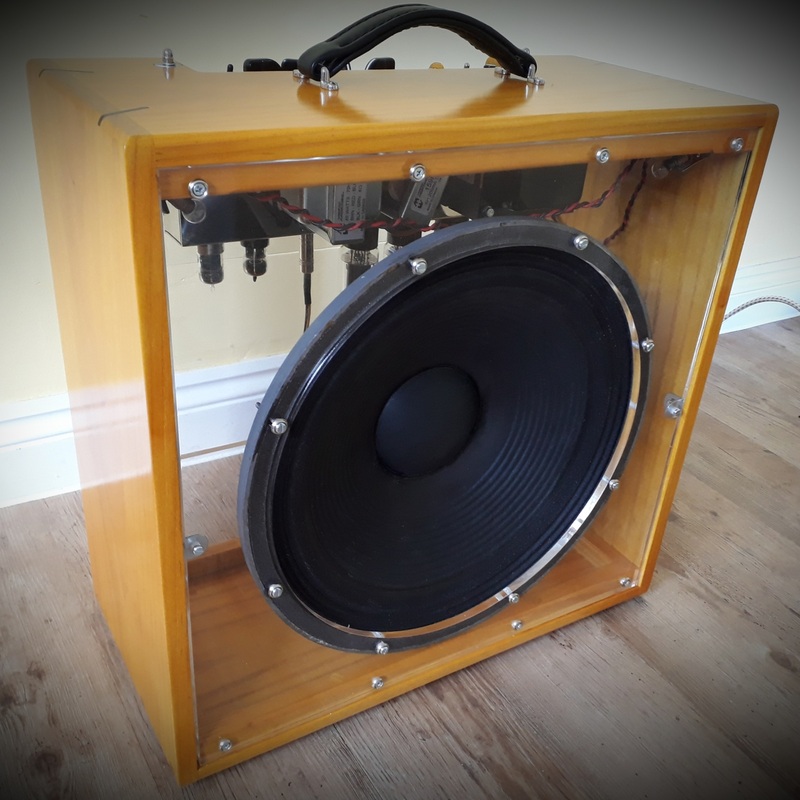 The amp was hand made by Iain, from the turret board to the ash/ebony cab and nitro finish. The chassis is a drilled out 5F2 Princeton chassis (it was a tight squeeze). He used a tweed Bassman power transformer and a 9 Henry choke. The output transformer is a standard Hammond Vibroverb. The AB763 Vibroverb's reverb, tremolo and Vibrato Channel were deleted. The Vibroverb has no Mid tone control on either channel but I added one to the Blackvibe to enhance tone shaping. I used a 100KA pot for the Mid/Raw control versus the AB763 standard 10KA so we can dial out some mid scoop and boost preamp gain. This added gain is enough to surpass the Vibroverb's Vibrato Channel preamp gain. With the Mid/Raw control at full "down" you get the Vibroverb's standard 6.8k of mid resistance so keep the Mid/Raw control full down for true Vibroverb tone but turn the control up and mid frequencies and gain are added. Near the end of the knob turn we're approaching tweed territory. I deleted the separate bias board and moved the components to the main circuit board. I also modified the bias circuit to add a Balance pot and increase the bias range. The Balance pot allows us to set the same bias current in both power tubes even without a matched pair. It also allows us to dial in some intentional mismatch to add sweet sounding even order harmonic distortion to thicken up the clean tone. The bias circuit 50k trim pot can bias 6L6GC tubes hot and yet can still cool the bias for a pair of JJ6V6 too. See Adjustable Balanced Bias for details. If you want to stick with the "normal" AB763 bias circuit just reference the Vibroverb layout at the bottom of this page. The filter cap "doghouse" has been eliminated by moving the filter caps to the main circuit board. The deletion of the reverb and tremolo freed up lots of circuit board real estate. A Fender style dual ground bus is used. The power tube screens, phase inverter and preamp triodes are grounded to the chassis at the input jacks. You must use a star washer on the input jack with the chassis ground to ensure a solid chassis ground connection. The power tubes are grounded to the chassis at the "Power Amp Ground" located near the power transformer. The transformer high voltage and 6.3v center taps are also grounded there. The bias circuit is grounded to the Bias Balance pot so use a star washer on the pot for a solid ground connection. 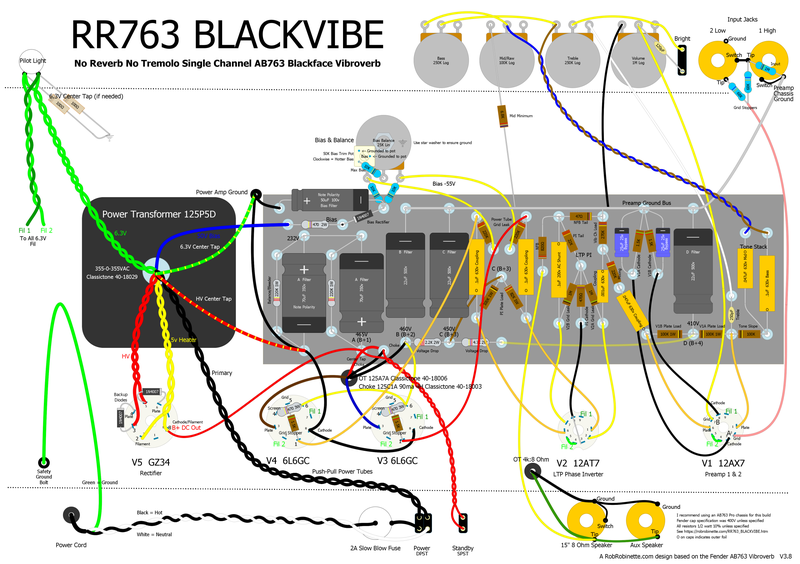 Although the Blackvibe is a single channel amp I kept the AB763 220k channel mixing resistor because it has an effect on the phase inverter's overdrive tone and preamp gain. When testing the Blackvibe I realized it had quite a bit more preamp gain than my blackface Band-Master and blackfaced Bandmaster Reberb's normal channels. I soon realized I had underestimated the load presented to the normal channel by the vibrato channel. I added a 270k "Vibrato Channel Load" resistor to take the place of the Vibrato Channel's 220k mixing resistor and 50k Tremolo Intensity pot to ground (the Tremolo pot is also in parallel with a 100K plate load resistor to "AC ground"). The Blackvibe's 220k Mixing and 270k Vibrato Channel Load resistors form a voltage divider which attenuates the guitar signal by 45% just like in the two channel AB763. I did this to recreate the most authentic AB763 blackface normal channel tone but you can jumper around the 220k mixing resistor and delete the 270k Vibrato Channel Load resistors to add preamp gain if you prefer. Placing the Vibrato Channel Load resistor on a switch will provide a nice "Preamp Boost" switch. We can also raise the value of the Vibrato Channel Load resistor to increase preamp gain. A 1M load resistor will only attenuate guitar signal by 18% compared to the 270k at 45%. I added rectifier "backup diodes" to protect the amp from a rectifier tube short failure. The diodes also make life easier on the rectifier tube so it should last longer. I increased the watt rating for many resistors to promote longevity and reduce speaker hiss. The layout also shows the use of metal film resistors on the input jacks in an effort to reduce hiss. The build can be simplified by eliminating the Bright Switch, Bright Cap and Standby Switch, none of which are really needed. 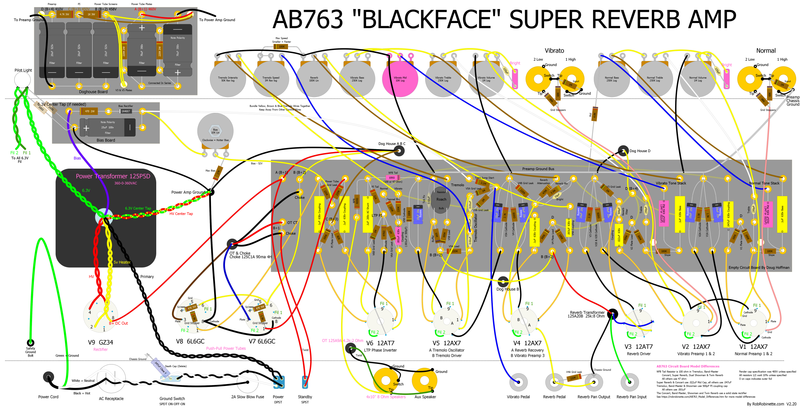 Many AB763 blackface modifications apply to the Blackvibe. It's a very simple amp compared to the Vibroverb below. Download the pdf here and the DIYLC file here. I recommend using an AB763 Pro chassis for the build because the power transformer will drop right in and it has only 4 preamp socket holes versus 6 for the AB763 reverb amps. The Pro chassis also has a rectifier tube socket hole. You will have extra control panel and preamp tube holes though. The open tube socket holes will aid in chassis cooling or you can cover the tube socket holes with covers from Mojotone.com. A custom faceplate can cover the unused control holes. You might want to consider adding a presence control and master volume to fill those empty holes ;) See the Blackvibe Micro layout to see a simple but effective Trainwreck Type-3 master volume and presence control. You can substitute two common 80uF 500v caps for the first two filter caps (70uF 350v A Filter shown in layout). You can send the Blackvibe DIYLC board file to HoffmanAmps.com and Doug will make an eyelet or turret board and even populate it for you if you like. There are many cab makers that can build you an AB763 Vibroverb cab that the Pro chassis will slide right into. I'm a big fan of Mergili cabs. Mojotone.com also sells excellent cabs. The Vibroverb came with a 15" speaker but you can build the Blackvibe with whatever speaker compliment you wish or simply build it as a head. The Classictone 40-18006 Vibroverb output transformer comes with 4, 8 and 16 ohm secondaries for very flexible speaker options. Stevie Ray Vaughan used an EVM 15L with a distinct American voice. Unfortunately they are out of production but re-cones do show up on ebay occasionally. Weber California 15 in ceramic 80 watt and AlNiCo is an excellent choice. The Weber California 15" was designed to mimic the JBL D130 which was a Fender Vibroverb OEM speaker (along with the Jensen C15n in the next paragraph). The 80 watt, 8 ohm ceramic version is much less expensive but louder than the AlNiCo version. I highly recommend the paper or "LargeH" dome option over the aluminum dome. The "LargeH" dome (large hole cloth) was designed to tame the brightest amps so use it if you prefer a darker tone. Remember to ask for the free speaker break-in service. Jensen C15n AlNiCo is the modern equivalent of what the AB763 Vibroverb came with from the factory and it gets goods reviews. American voice and relatively inefficient so not as loud as other speakers. Eminence legend 1518 is a popular 15" speaker. It has a loud, efficient and punchy American voice. If you prefer 12" speakers my recommendation is a pair of Weber 12F150 ($117, 16 ohm, 50w, light dope, standard dust cap) which is their go-to blackface speaker. Their $52 Weber Ceramic Signature 12" are also great blackface speakers. My favorite 10" blackface speaker is the Weber 10F150 ($97, 16 ohm, 50 watt, light dope, standard dust cap). You'll need a pair of them to safely handle the amp's 40 watts of output. A less expensive choice is the very nice $47 Weber Ceramic Signature 10". Weber on speaker dope: Put simply: the higher gain you use, the more dope you should have on your speaker. The Blackvibe 6V6 is designed for those that don't need the big 40 watt output of the 6L6 Blackvibe. The Blackvibe 6V6's 22 watts of output is enough for most club gigs and still sounds great in the studio. Although the Blackvibe 6V6 uses the AB763 Deluxe Reverb power and output transformers we use higher phase inverter and preamp supply voltages to keep the tone closer to a 6V6 Vibroverb. Voltage dropping resistors and the bias circuit are changed to suit the 6V6. The NFB tail resistor was increased from 47 ohms to 56 ohms to compensate for the lower output transformer secondary voltage of the 6V6 power amp. Although the GZ34 rectifier tube is specified, power supply filtering is slightly reduced compared to the 6L6 Blackvibe to support the 5U4GB rectifier in case we want to use it to lower the amp's voltages. We'll use the AB763 Deluxe Reverb's chassis, power transformer, output transformer and choke. I recommend using an AB763 Deluxe Reverb chassis for the build because the transformers will drop right in. The Deluxe Reverb chassis also has a rectifier tube socket hole. You will have extra control panel and preamp tube holes though. The open tube socket holes will aid in chassis cooling or you can cover them with covers from Mojotone.com. A custom faceplate will cover the unused control holes. You might want to consider adding a presence control and master volume to fill those empty holes ;) See the Blackvibe Micro layout to see a simple but effective Trainwreck Type-3 master volume and presence control. We can substitute two common 80uF 500v caps for the first two filter caps (70uF 350v A Filter shown in layout). You can send the Blackvibe 6V6 DIYLC board file to HoffmanAmps.com and Doug will make an eyelet or turret board and even populate it for you if you like. Weber California 15 in ceramic 80 watt and AlNiCo is an excellent choice. The Weber California 15" was designed to mimic the JBL D130 which was a Fender Vibroverb OEM speaker (along with the Jensen C15n in the next paragraph). The 80 watt, 8 ohm ceramic version is much less expensive but louder than the AlNiCo version. I highly recommend the paper or "LargeH" dome option over the aluminum dome. The "LargeH" dome (large hole cloth) was designed to tame the brightest amps so use it if you prefer a darker tone. If you prefer a 12" speaker my recommendation is the Weber 12F150 ($117, 8 ohm, 50w, light dope, standard dust cap) which is their go-to blackface speaker. Their $52 Weber Ceramic Signature 12" is also great blackface speaker. Remember to ask Weber for their free speaker break-in service. My favorite 10" blackface speaker is the Weber 10F150 ($97, 8 ohm, 50 watt, light dope, standard dust cap). Another option is Weber's #1 recommendation for the Princeton Reverb, the 10F150T. A less expensive choice is the very nice $47 Weber Ceramic Signature 10". 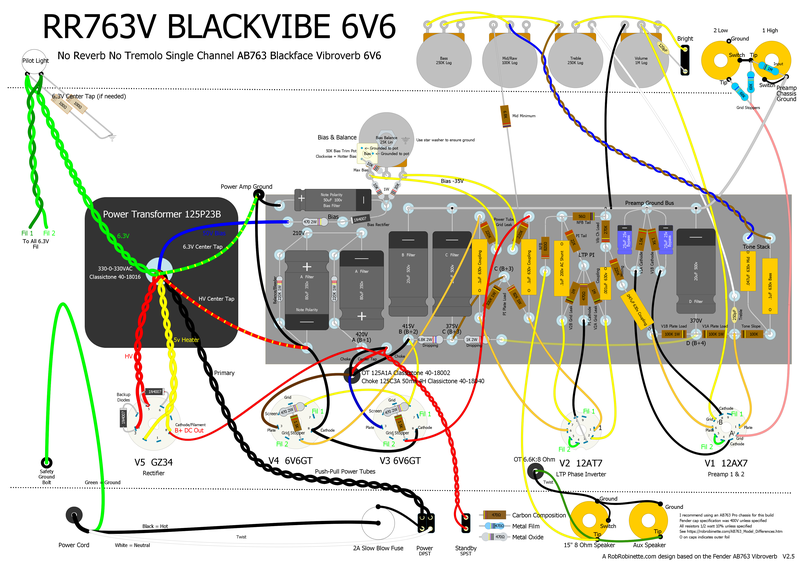 Many AB763 blackface modifications apply to the Blackvibe 6V6. This is the one watt, 12AU7 push-pull power tube version of the Blackvibe that is perfect for true bedroom level practice and studio work. The preamp and long tail pair (LTP) phase inverter are 100% AB763 Vibroverb but the power amp uses a single, cathode biased 12AU7 power tube wired in true push-pull. Throw a Strymon Flint reverb & tremolo pedal in front of the Blackvibe Micro and you have a Vibroverb Vibrato channel too. 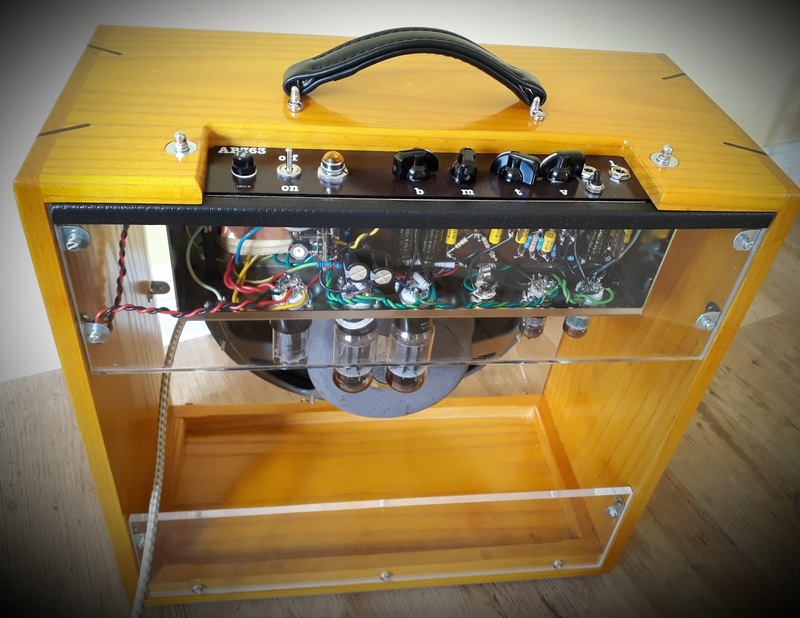 Update 2/2019: I did a major revision of the Micro design to make it more compatible with a blackface or silverface Princeton Reverb chassis. I took advantage of the extra control hole on the front panel to add a Presence Control. I also incorporated the standard Princeton Reverb cap can and deleted the bright cap, bright switch and standby switch to match the Princeton Reverb. I also changed from an EZ81 rectifier tube to the more common GZ34 but still offer the EZ81 and solid state rectifier as an option. A Presence control is added to the NFB circuit which has been massaged to compensate for the Micro's low output transformer secondary voltage. A Trainwreck Type-3 post phase inverter master volume is added to help control how hard the little power tube is driven. Large value power tube grid stop resistors are used and the grid leaks are reduced. The grid stopper and grid leak resistors have been rearranged to form a voltage divider to attenuate the phase inverter output to help the little triodes work as our power tubes without being overwhelmed. The Blackvibe power supply has been modified to keep the little power tube happy. Since our triode power tube has no screens the screen power node has been deleted. The choke now smoothes the entire amp's power supply. The 6.3v heater center tap is elevated by connecting it to the power tube cathode resistor (see layout below). Princeton Reverb chassis layout. The preamp ground bus is grounded at the High Input jack ground terminal. Power Transformer wires match the Classictone 40-18027 for 120v USA mains power. Click the layout to see the high definition version. Download the layout pdf here and the DIYLC file here. 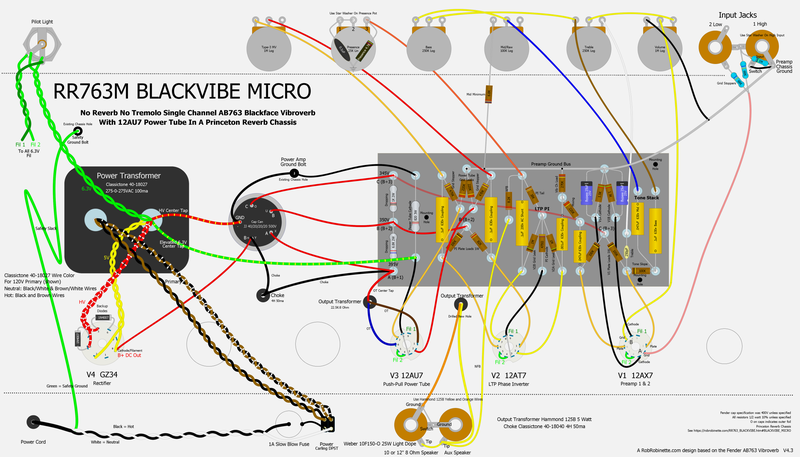 I am in the process of building the first Blackvibe Micro but I'm not expecting any issues since it uses the power amp from the very successful Bassman Micro LTP amplifier. I'll update this page when I get it built and tested. I recommend the use of a Princeton Reverb chassis and Classictone 40-18027 Princeton Reverb power transformer. The 40-18027 supports 120v and 240v mains and has two high voltage windings. We'll use the 275-0-275v 100ma red-white high voltage leads which are perfect for the Blackvibe Micro. The entire amp uses only 24ma at idle. 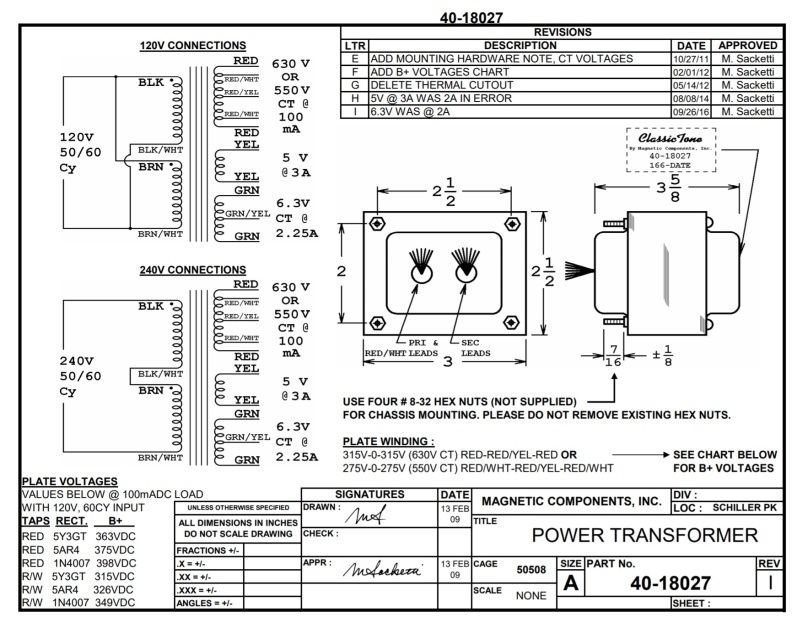 The power transformer has a 6.3v center tap so an artificial center tap is not needed. We connect the 6.3v center tap to the hot side of the power tube cathode resistor to elevate its ground reference to reduce heater hum. If you need a stand-up transformer the Classictone 40-18085 is perfect. 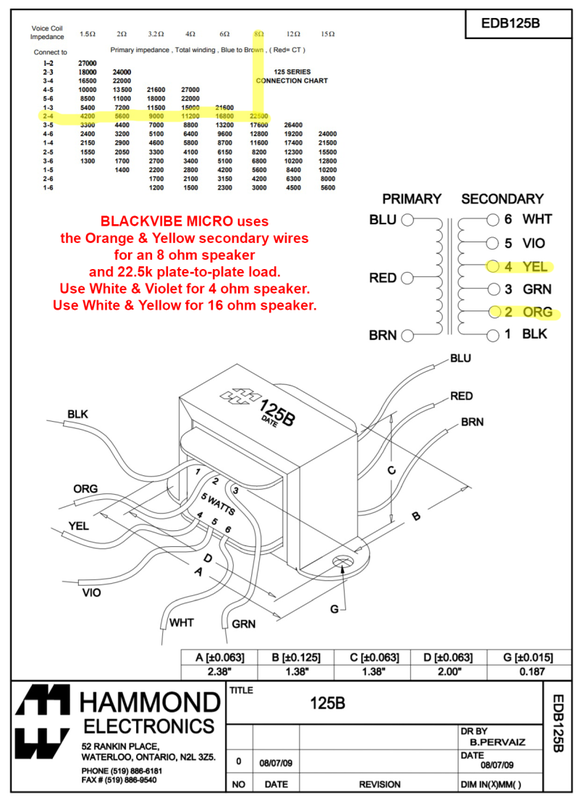 The output transformer is a 5 watt rated Hammond 125B wired for 22.5K:8 ohms (use the orange and yellow secondary wires--do not connect the black wire). This little output transformer will give us some big amp transformer saturation for Vibroverb-like compression and sustain. I purchased mine from Mouser.com. A Classictone 40-18040 4H 50ma choke easily supplies the entire amp with ripple-free power. The cap can is a JJ 40/20/20/20uF 500v can. I sourced it and its clamp from Mojotone.com. The can's terminals are marked with Y, X, U, O and "-" stamped in the terminals. The Y terminal is 40uF and the X, U and O have 20uF. The "-" is the negative or ground terminal. You can use a standard Princeton Reverb size cab with either a 10" or 12" speaker. Mojotone sells a nice Princeton Reverb head cab too. The amp sounds great with full size cabs and speakers but a Princeton Reverb sounds best with a 10" speaker. If you want something different you can use four 6 inch speakers in a cab and call it a Super Reverb Micro. A 10 or 12 inch speaker works great for a Vibroverb Micro but you can use a 15" just like a real Vibroverb. If you prefer a 12" speaker my recommendation is the Weber 12F150 ($117, 8 ohm, 25w, light dope, standard dust cap) which is their go-to blackface speaker. Their $52 Weber Ceramic Signature 12" is also a great blackface speaker. If you use a Princeton Reverb cab then I recommend you go with Weber's Princeton Reverb recommendation, the 10 inch Weber 10F150T ($97, 8 ohm, 25 watt, light dope, standard dust cap). A less expensive choice is the very nice $47 Weber Ceramic Signature 10". Remember to ask Weber for their free speaker break-in service. 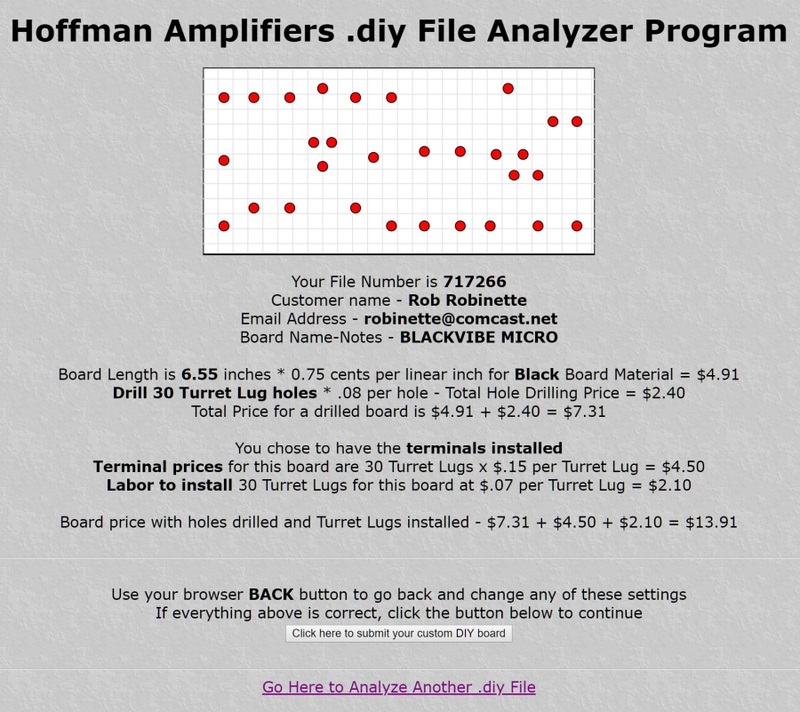 You can upload the Blackvibe Micro circuit board DIYLC file to Hoffmanamps.com and Doug will make an eyelet or turret board for you. He can also populate the board for you if you'd like. The empty board with eyelets or turrets installed is $14 + shipping. 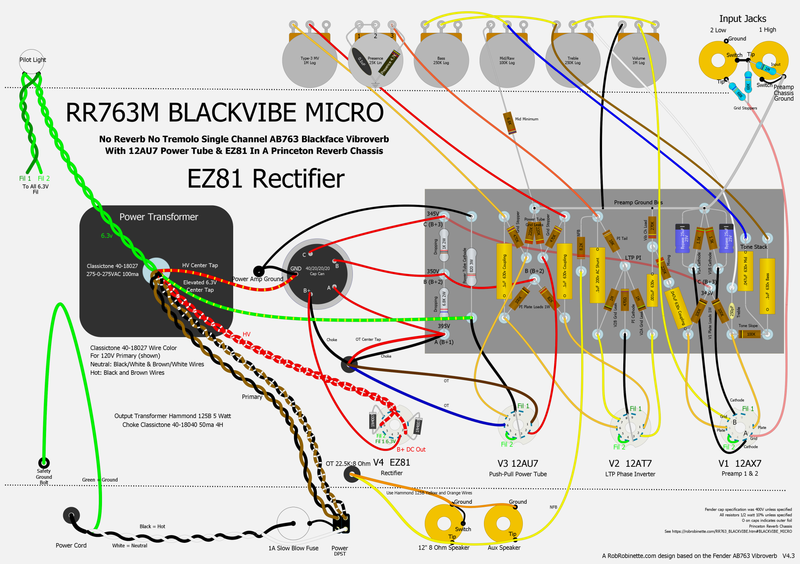 My Blackvibe Micro turret board order at HoffmanAmps.com file #717266. You'll also need a chassis, cab, speaker, power cord, wire, output transformer and choke. The 40/20/20/20uF 500v JJ cap can and mounting clamp came from Mojotone.com. 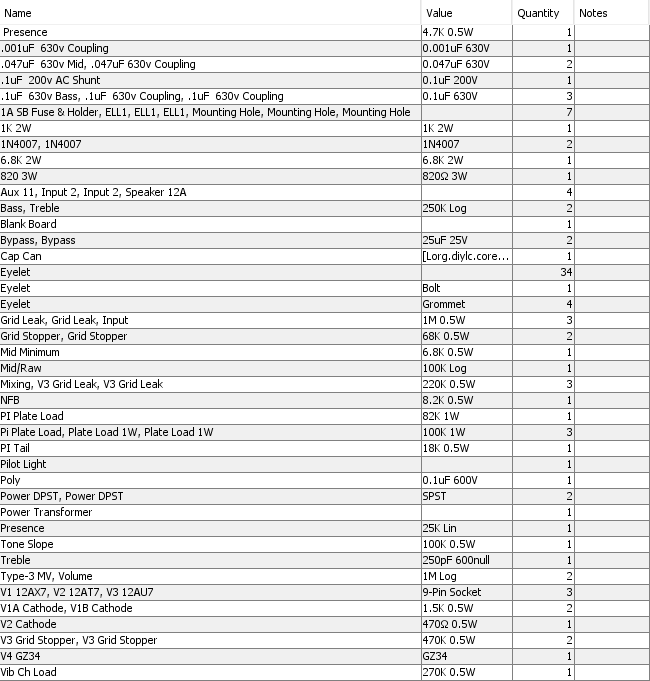 Note the 120v and 240v primary options. For 120v mains voltage we connect the Black & Brown wires together at the power switch and we connect the Black/White & Brown/White wires (see layout above). For 240v mains we join just the Black/White and Brown wires. We'll connect the Red/White 550v high voltage wires to the rectifier tube. Shrink-tube the two unused red wires so they cannot touch each other or anything else. We do not use the Black secondary wire. To summarize the parts sources I used: I purchased the Princeton Reverb chassis and most parts from Mojotone.com. I purchased the Classictone power transformer and choke from AmplifiedPartsDirect.com. I had to go to Mouser.com to get the Hammond 125B output transformer. Doug Hoffman at HoffmanAmps.com made my turret board. I used to make my own turret boards but with HoffmanAmps.com accepting DIYLC files to make custom boards it's just too easy and inexpensive to bother with making them myself. Remember when playing the Blackvibe Micro you need to set the Mid tone control and the Presence control full down to get standard Vibroverb tone. The Mid tone control also has more authority than the typical blackface Mid control and near full up most of the blackface mid scoop is removed for a boost in gain and a tweed-like tone. When you turn up the Mid control for boost will need to roll back the Bass. The Presence control is a late-in-the-circuit tone control that can be used to fine tune your clean and overdrive top end. 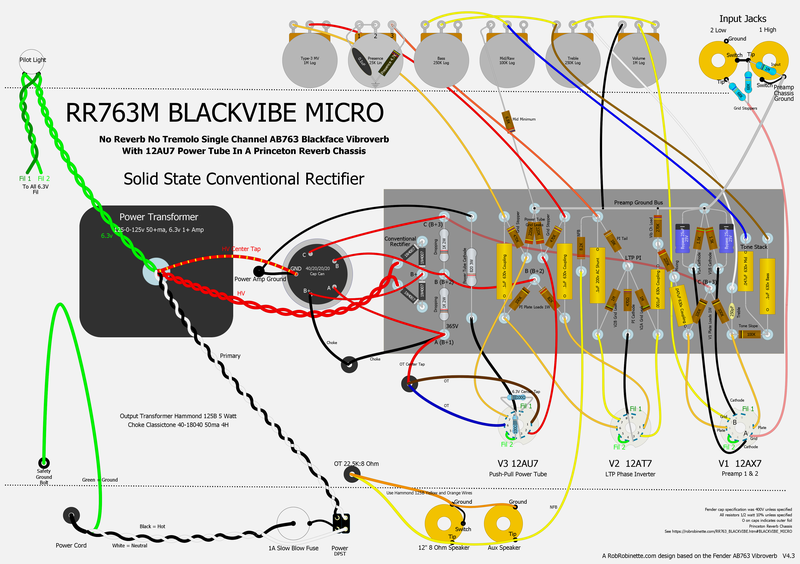 Many AB763 blackface modifications apply to the Blackvibe Micro. Larger circuit board is used to add the four 1N4007 diode rectifier circuit. Click the layout to see the high definition version. Download the Hoffman board DIYLC file here, the pdf here and DIYLC file here. You can upload the Blackvibe Micro Solid State Rectifier circuit board DIYLC file to Hoffmanamps.com and Doug will make an eyelet or turret board for you. He can also populate the board for you if you'd like. The empty board with eyelets or turrets installed is $15 + shipping. If you want to use a tube rectifier but your power transformer does not have a 5v heater circuit you can use an EZ81 rectifier tube which uses a standard 9 pin socket and the same 6.3v heater circuit as the rest of the tubes. The EZ81 uses 1 amp of 6.3v heater current and is rated for up to a 50uF first filter cap. You can use one of the Princeton Reverb's 9-pin sockets to mount an EZ81 rectifier tube. It uses 6.3v heaters just like the other 9-pin tubes so a 5v transformer tap is not needed. The EZ81 rectifier uses pins 4 & 5 for 6.3v heaters. Pins 1 & 7 are the plates. Click the layout to see the high definition version. Download the pdf here and DIYLC file here. I'm a fan of late-in-the-circuit tone controls which allow tone tweaks with less side effects and the Presence Control is one of my favorites. To add a Presence Control we'll delete the 47 ohm NFB Tail resistor and replace it with the presence circuit. The circuit is made up of a 25KL pot with a .1uF (600v poly) cap and 4.7k 1/2 watt resistor. We also have to adjust the size of the NFB resistor and phase inverter tail resistor (PI Tail in layout) to compensate for the presence control's added resistance (going from 47 ohm NFB tail to 4.7k of tail resistance). 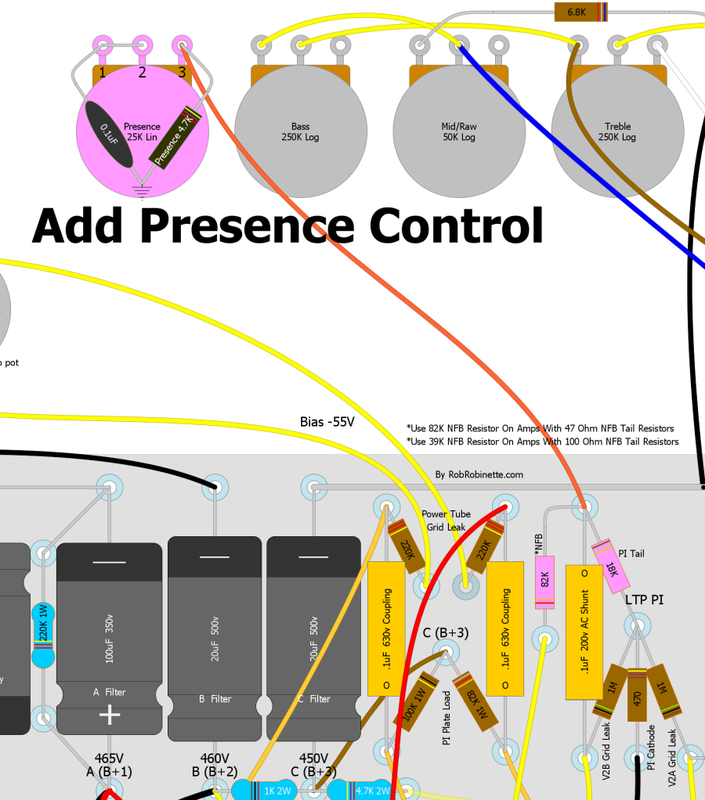 With this presence circuit you'll get standard AB763 tone with the presence pot turned full down. The 4.7k presence resistor on the presence pot acts as the NFB Tail resistor. The .1uF cap blocks DC flow through the pot to eliminate "static" when adjusting the control. The cap also sends high frequencies from the NFB loop to ground which boosts highs at the speaker. These boosted highs have less NFB so they are "thicker and harrier" with additional harmonic and intermodulation distortion which adds "presence". Since the back of the presence pot is used as a ground be sure and use a star washer on the pot to ensure good pot-to-chassis contact. The Presence Cap bleeds NFB high frequencies to ground and also blocks DC from flowing through the Presence pot. 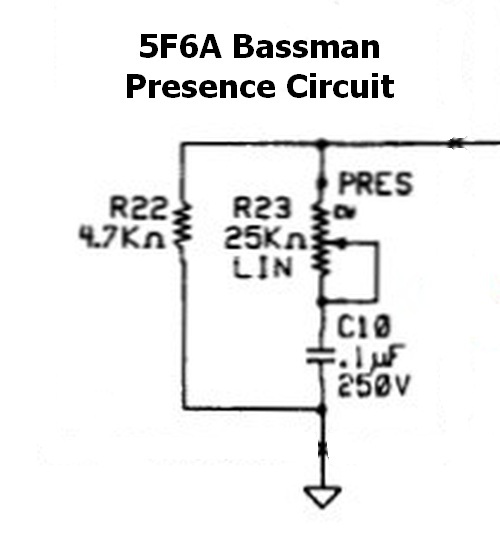 This circuit differs from the Fender 5F6A schematic and layout but matches what was actually installed in most 5F6As from the factory. The ratio of the NFB resistor to the NFB Tail resistor determines the level of NFB signal. The ratio of our Blackvibe is 820 / 47 = 17.4. Since the NFB tail resistance is being increased to 4.7k we can use the NFB ratio to calculate the appropriate NFB resistor to pair with the presence circuit: 4.7k * 17.4 = 82k for the new NFB resistor. Since the presence control adds 4.7k of tail resistance to the phase inverter circuit we need to decrease the PI Tail resistor from 22k to 18k to compensate. Be sure and use a star washer on the Presence pot since we are using it for a ground connection. To add a Presence Control we delete the 47 ohm NFB Tail resistor from the circuit board and replace it with a 4.7k Presence resistor mounted on the Presence pot. The .1uF Presence capacitor forms an RC low pass filter with the NFB resistor. The Presence pot is wired as a variable resistor to control how much high frequency signal is bled to ground. The NFB resistor is increased to 82k and the PI Tail resistor is reduced by 4k to make up for the added NFB tail resistance. We can use this circuit to install a presence control in any blackface or silverface amp with a long tail pair (LTP) phase inverter. See the AB763 Presence Control mod for details. Reverb, tremolo and a second channel add a lot of complexity to AB763 amps. Download the pdf layout here and the DIYLC file here. 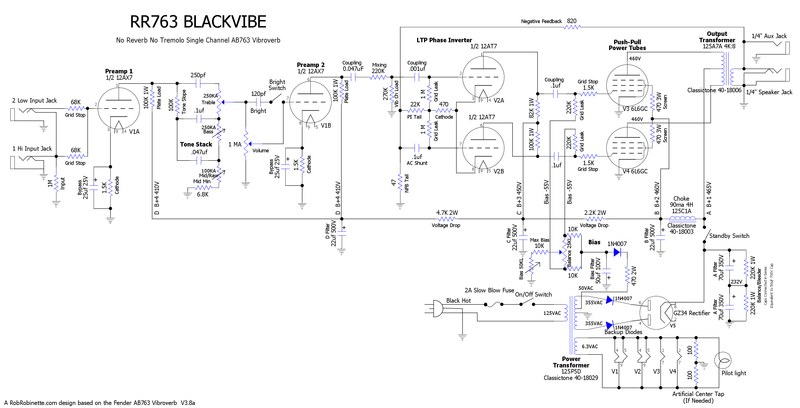 I used Vibroverb component values in the Blackvibe amps but you may want to mimic a Super Reverb or one of the other blackface amp. The layout below has the components that change by AB763 model highlighted in pink. Two components you may want to consider changing in the Blackvibe is the tone stack's Mid cap and phase inverter coupling cap. The Vibroverb used a .047uF Mid Tone cap while most other AB763 amps used a .022uF. The larger Mid cap gives slightly less mid scoop and shifts the Mid Tone control slightly higher in frequency. If you plan to use a 15 inch speaker with your Blackvibe I recommend you stick with the .047uF Mid cap. The phase inverter coupling cap was .001uF in the combo cab AB763 amps but the head cabs used a 50% smaller 500pF cap. The smaller coupling cap can sound better in closed back cabs and the heavy overdrive tone is slightly tighter and more composed. For more detailed info see the AB763 Model Differences page.